Asian Pacific Alumni of UCLA will hold an awards reception to recognize outstanding UCLA students and network with fellow Bruin alumni on Monday, May 20, from 6 to 9 p.m. at UCLA’s James West Alumni Center. APA-UCLA annually provides UCLA student leadership awards of $12,000 and oversees awards for the Korean Alumni, the Sho Iino Foundation, the Sam Law Leadership, and the Charlie Woo Leadership scholarships. 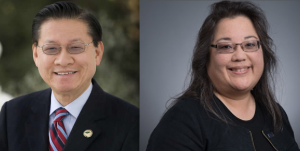 Featured speakers are Mike Eng, member of the Los Angeles Community College District Board of Trustees and former member of the State Assembly; and Lois Takahashi, UCLA professor and chair of urban planning, professor of Asian American studies, and director of the UC Asian American and Pacific Islander Policy Multicampus Research Program. Dinner will be provided by The Park’s Finest BBQ. Raffle prizes will be given away during the night. Admission is $15 presale, $25 at the door for UCLA Alumni Association members, $20 presale and $25 at the door for the general public. Presale tickets are available until Thursday, May 16, at http://apauclascholarshipreception2013.eventbrite.com.